My favorite pink. If you grow it, could I have seeds? Of all the species in the Papaver genus, I think I like peony poppies the best. Perhaps you know them by a different name, for they are also called lettuce leaf poppies, bread seed poppies, and opium poppies. Yes, that opium. I was just reading about them on Wikipedia and discovered they have sub-groups. I prefer the ones that actually look like peonies, such as the soft pink pictured at left. Unfortunately, I no longer have that one. If you ever see it being sold or have some seed of it you can share, please get in touch. The one I’m growing now was sold to me as a pink peony-flowered poppy, but this is really from what the Wikipedia article calls the Laciniatum group, “whose flowers are highly double and deeply lobed, to the point of looking like a ruffly pompon.” I don’t want a pompon, and I don’t want coral pink! But try telling that to a catalog copywriter. I know, hearing them called opium poppies made you a bit nervous, didn’t it? The Wikipedia article that I referred to earlier said that low-morphine varieties are definitely legal. If you buy seeds of breadseed poppies, I think you can be certain you are getting a low-morphine variety. As for the more decorative varieties, if Michael Pollan is correct, ignorance is bliss. Don’t ask, don’t tell. If someone wants to know what they are, they are peony poppies (Papaver paeoniflorum) or (sigh) laciniate poppies (Papaver laciniatum)–and aren’t they beautiful? They do best when direct sown. Most gardeners can sow in late fall, and they will sprout in late winter and be ready for business shortly after your bona fide peonies are done blooming. I can sometimes get away with that, but often the seedlings don’t make it. I usually try sowing in late winter or early spring, catching the last dreary snowfall or at least a good hard frost. They seem to need cold to germinate. They like rich garden soil and plenty of room. The best ones are always those that have been thinned to–okay, I don’t really know how far apart is ideal. All I know is I never thin them enough. I always think, “What if this is one of my long-lost beautiful pink ones?” I try for 6 inches apart but I think it should be more, maybe even double that. Does anyone out there have a good rule of thumb? 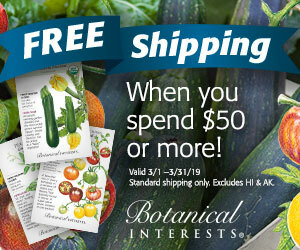 It’s not seed buying time, and I hope you don’t forget these when you start flipping through catalogs. But I wanted to tell you about these now, so those of you already growing them don’t miss out on the extra bloom that comes from deadheading. They are the only poppies I know that you can deadhead, so take advantage of it. I’m so happy to discover what I have growing in my garden and delighted to know I can dead head for more bloom. Thanks, I’ll do just that next year and just allow one or two big fat seedpods to mature for the following years planting. Mine are the peony type in a brilliant coral. I have the pom pom one in the ballet pink we love so much. They showed up all by themselves a few years ago. One year they didnt come back but mostly they do. Can I post a pic here? Not sure how they got there. I did go out and dead head the spent bloom heads, they look so alive still. Shall I hang them in the shade and get the seeds once dried? 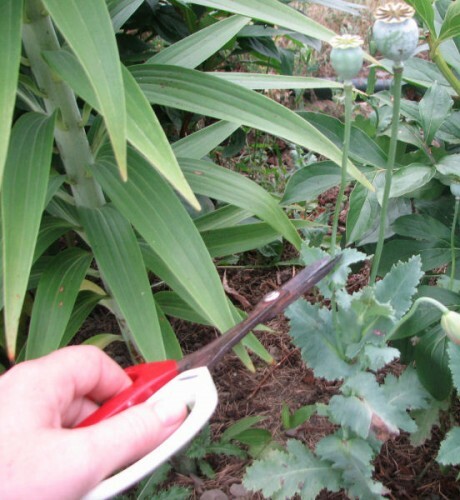 You should be able to get more blooms out of your plants once you’ve deadheaded them. The deadheads won’t make viable seed, however. To get seed to use for next year, I let the seed heads dry on the plants, then snip off the seed heads after the little “windows” open on them and put them in a paper bag or some other container that can breathe. You can’t post a picture here, but you can post on the Cold Climate Gardening Facebook page. Hi Kathy, wondering when is it best to transplant poppy roots? I had a digger clear some of my garden and move soil to another area – this has resulted in an extensive amount of poppies growing all over one area leaving me unable to sow grass seed. I would like to confine them to a particular spot in the garden but I’m guessing I need to wait until flowering season has ended? I believe I have to dig down to the root and move over to new area. I believe you are referring to Oriental poppies, which come back every year. They have a taproot that can go quite deep, and they regenerate from small pieces of root left in the ground. These kind of poppies go dormant after blooming. That is the best time to move them. But they don’t always transplant well. Smaller pieces do better, I think. But any bit of root left in the place you don’t want them will come back to haunt you. Good luck! where can i get light purple peony poppy seed? I have the pink peony poppies. My question is whether I can deadhead them while the seed pod is still green and get quality seed to grow or do I have to wait to cut them when the seeds are already mature? I always harvest seed when the pod is dry and brown and the holes at the top have opened. I don’t know if the seed will mature if the pods are cut when green. Pink peony poppies have just started to bloom in my garden. I wasn’t sure what they were at first, until I read your info. The seeds were from annual oriental poppies and wild red ones too. Suspect some sort of cross breeding has taken place somewhere in the pollination stage! Any way they are a joy to behold. I will definitely be dead heading as you recommended. I didnt know you could deadhead them! nice! I started seeds inside this April. They transplanted beautifully! I put a few in pots. They too, did well. hi i believe i have the pink peony variety in our garden which has just come out in bloom.only just found out which type they are from your picture .thank you. 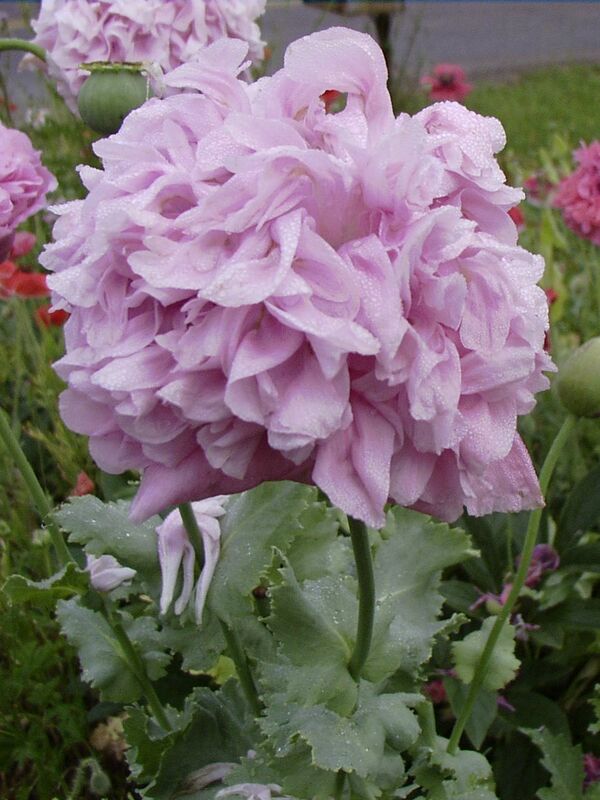 Have you visited http://www.onestoppoppyshoppe.com for your pale pink poppy? They have a variety listed as lavender that looks very similar to what you are looking for. Good luck! Im getting married and want to keep cost down by getting my mother to grow yes grow my flower! We have chosen the peony rose but these poppies are darling! My mum lives in a very cold part of new zealand so i think she could grow these successfully with the peony rose! Do you know how well the poppies will do as a cut flower? or in pots? And when,where who and who is the best to get seeds? and will i have problems with sending seeds overseas? Hi, Ginger–they are not good as cut flowers. I think they would do well in pots but you would have to direct sow the seed as they don’t like being disturbed at all. And so you would have to time it just right as each flower only lasts a day or two. I definitely want some pink poppy seeds-I will buy them if available. I don’t sell them. You need to look on eBay or one of the seed companies for them. I have these poppies in deep red in the middle of my flower bed. I love how tall the stems grow. I don’t know how my dad did it but he transplanted them from a friend. I’m hoping to get some in the pink variety for next year. I wonder if they are the Oriental poppies. I believe we have the light pink poppy you are seeking, we had a banner year here in Iowa. Must have been all the rain? We live on a century farm here and the peony poppies were here 50 years ago from our Aunt. We are in the process of saving seeds and willing to share with you. We also took photos this year and can email you a few pictures. Chris, they don’t transplant well at all, so everyone grows them from seed sown directly in the garden. I doubt you will find plants for sale anywhere. 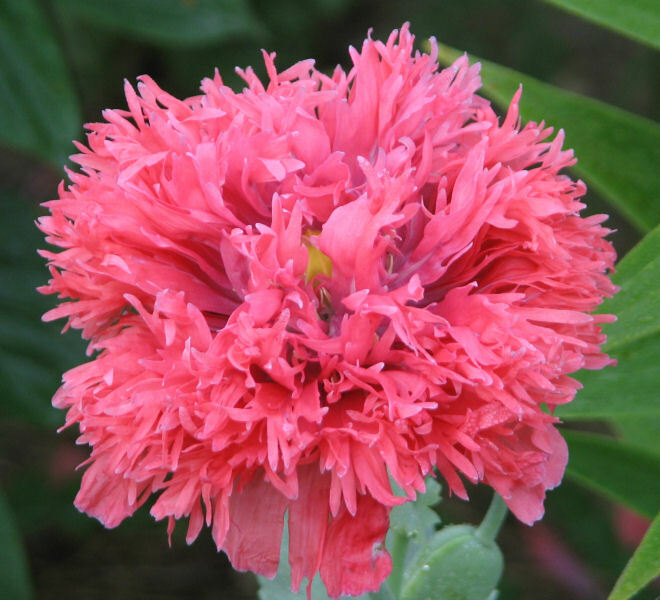 I am looking at a pack of peony poppies right now and it says to plant them 24″ apart. I don’t think I would sow the seed 24″ apart, but that might be a good spacing to thin them to. More for ‘the list’! I have always loved the way they look in others’ gardens but have yet to grow them! Thanks for the info. Your reference to opium makes me laugh, we recently found a marjiana plant growing in our newly acquired house’s front yard in Colorado. My father suggested we just let things grow the first year to see what came up … what a surprise. Glad to have found someone else dealing with cooler climes. These are gorgeous poppies. 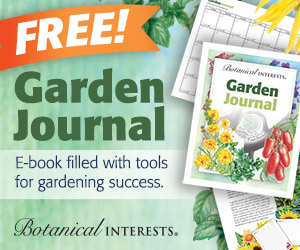 Thank you for the growing info – I think I will add some to my garden next year! jodi–I acquired the pink one through the North American Cottage Garden Society (which has since disbanded) seed exchange. The gardener donating the seed said it was a deep pink Oriental poppy and the seed had been obtained from Australia. I definitely would like to have some of these and hope I remember next spring! I have red ones, pink ones, almost black ones, some that are slightly tinted with other colour from cross pollinating (I assume.) They freerange everywhere, but I don’t have the pale pink variety you show–mine is a deeper pink and mostly single, but the big red and wine ones are all peony-poppies. 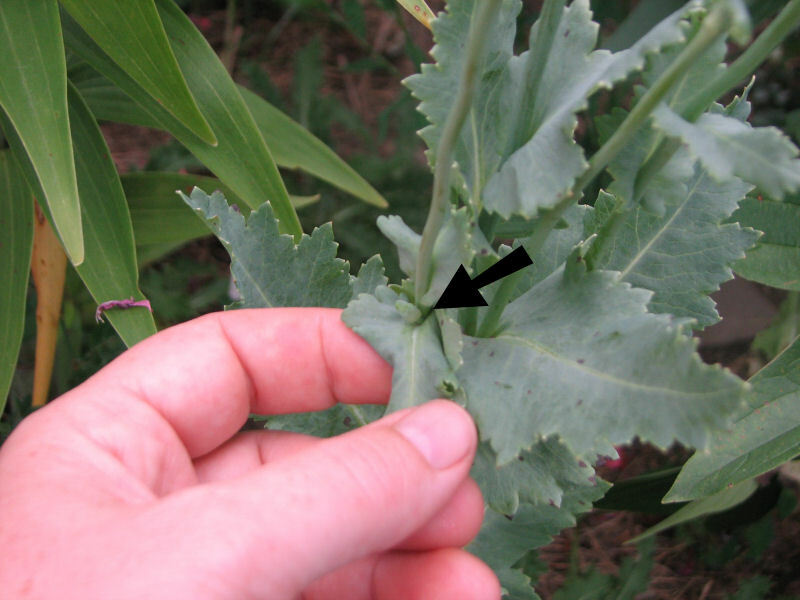 We also call them lettuce poppies here in case any neurotic types from the Canadian Food Inspection Agency are around. How absurd some bureacrats and bureacracies are! I love the seedheads as much as the flowers. A neighbor grows them in her garden, and every year I think, I must try some in mine. But I always forget. Maybe next year . . .